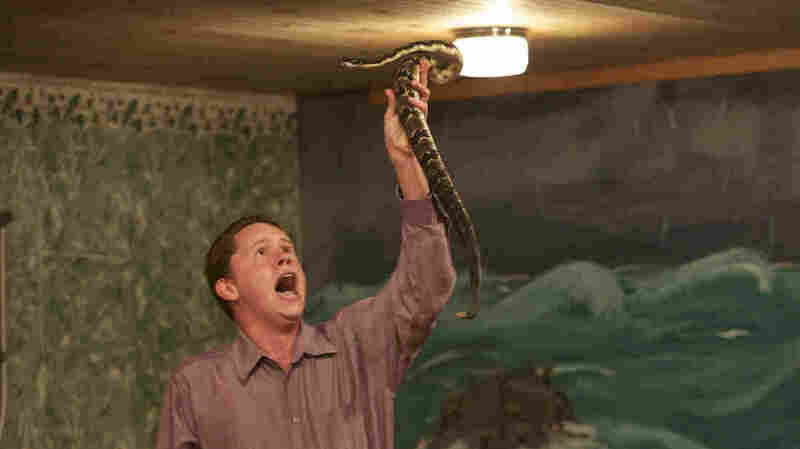 Snake-Handling Preachers Open Up About 'Takin' Up Serpents' Pastor Jamie Coots says his Pentecostal church is really not that different from other churches. "We sing, we preach, we testify, take up offerings, pray for the sick, everything like everybody else does. Just, every once in a while, snakes are handled," he says. Andrew Hamblin preaches while holding a snake above his head, LaFollette, Tenn.
Snake handlers dwell at the edge of the spiritual frontier — a community of people who are willing to die for their faith three times a week in church. 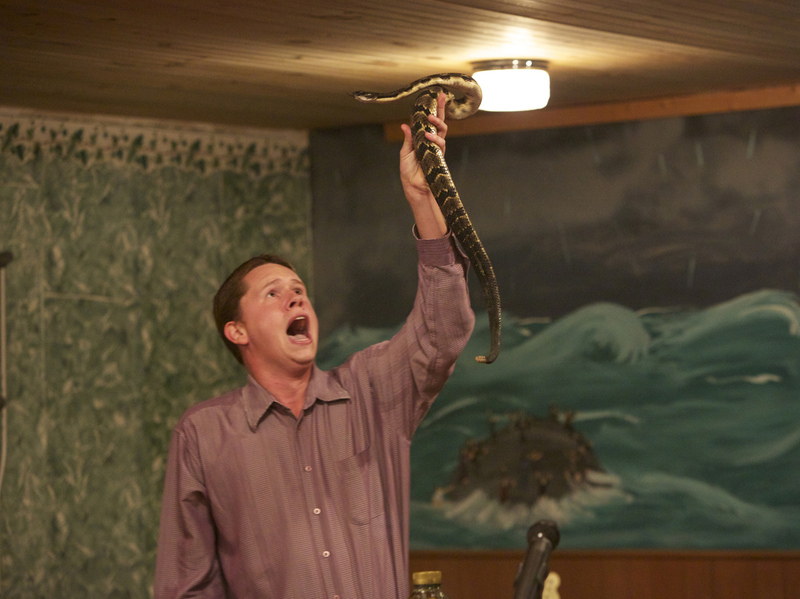 Members of the Pentecostal Holiness Church take up venomous serpents to prove their faith in God. The practice is still widespread in Appalachia, though mostly hidden. Pastor Jamie Coots warns about the scent in the snake room behind his house in Middlesboro, Ky.
"It's strong, so I'll go ahead and tell you that," he says as he unlocks the squeaky door. We're greeted by the rattles of dark-complexioned pit vipers lying about in glass cages. The air in the snake room is warm, musky and malevolent. "Got rattlesnakes: the timber rattler and the canebrake," says Coots, inventorying his reptiles. "We have northern copperheads. And that's the only two cottonmouths we have." Coots is a well-known snake handler here in southeastern Kentucky. He's 41, stout and bald, with a Vandyke beard. He's the third generation of Coots to take up serpents; his 21-year-old son, Little Cody, is the fourth. "Takin' up serpents, to me, it's just showin' that God has power over something that he created that does have the potential of injuring you or takin' your life," Jamie Coots says. Coots' church, the Full Gospel Tabernacle in Jesus Name, is a white, rectangular affair located on a hilly lane in the coal-mining town of Middlesboro. Like most snake-handling churches, the congregation is small — about two dozen, and most of them are family. Coots says they're really not that different from other churches. "We sing, we preach, we testify, take up offerings, pray for the sick, everything like everybody else does," he says. "Just, every once in a while, snakes are handled." Worshiping with snakes dates back more than 100 years, but today, the major Pentecostal denominations denounce the practice. There are an estimated 125 snake-handling churches scattered across Alabama, Georgia, the Carolinas and Appalachia, where the tradition is strongest. Snakes in church are against the law everywhere but West Virginia, though in most states it's a misdemeanor offense the authorities don't bother with. 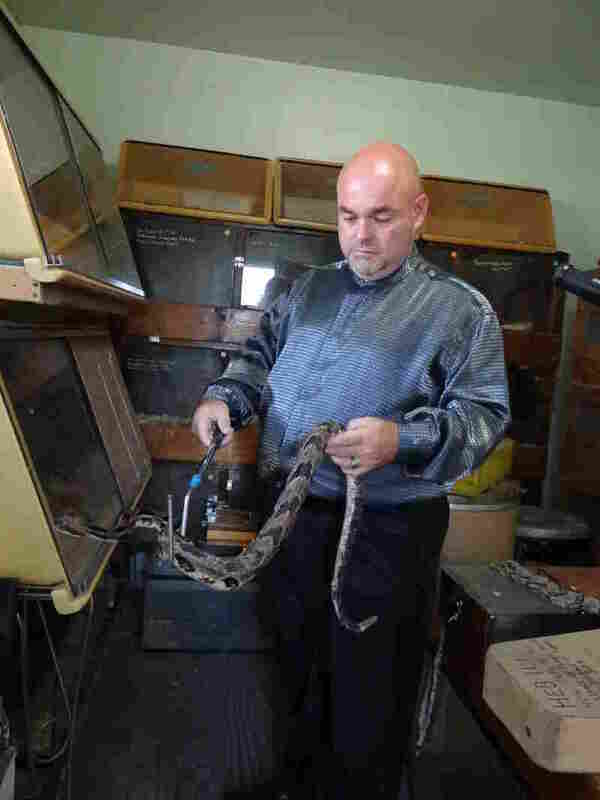 Pastor Jamie Coots in his snake room in Middlesboro, Ky.
"They shall take up serpents; and if they drink any deadly thing, it shall not hurt them; they shall lay hands on the sick, and they shall recover." There are the five signs often practiced in snake-handling churches, including the sipping of poison such as strychnine or lye as a test of faith. Coots has been bitten nine times by venomous snakes. Each time he refused medical attention. Half of his right middle finger is gone as a result of a fang from a yellow rattler. In 1995, a woman who was bit in his church refused to go to the hospital; she died on Coots' couch while church members prayed over her. Such is the conviction of his belief that Coots has agreed not to call EMS if Little Cody is bitten. "He has been bit five times by cottonmouths, and he has already told me, 'Dad, I'll never go to a doctor,' " Coots says. Skeptics wonder if snakes handled in religious services are milked, defanged, weakened by mistreatment or in any way made less deadly. "It's kind of like playing Russian roulette. The more frequently you handle [snakes], the more likely you are to get a bite. Serpents don't get tamed," says Ralph Hood, a psychology professor at the University of Tennessee at Chattanooga, who has documented hundreds of hours of serpent handling over 25 years. Having said that, Hood says he has brought herpetologists to services to try and understand why it is that handlers can pick up reptiles with impunity, even walk on them barefoot, and receive so few snake bites. "All I know is that these people do handle [snakes], and most of the time they are not bit, and they can do what scientists think is not likely. Nobody has a good explanation," he says. The National Geographic Channel followed two snake-handling preachers off and on for a year for a documentary series called Snake Salvation that will air this fall on Tuesday nights. Pastor Jamie Coots is one of the series' subjects. "Snake handling fascinated me because it's such an extreme gesture of faith," says Matthew Testa, the series' executive producer. "We set out to tell this story from the snake handlers' point of view, to really humanize them, not to judge them, and to show how important religion is in their daily lives with their daily struggles." The Tabernacle Church of God in LaFollette, Tenn., is a short drive through the Cumberland Gap from Coots' church. The pastor here is Andrew Hamblin, a lanky, charismatic 22-year-old, who is the other preacher featured in the TV series. Hamblin wants to modernize the practice of handling snakes in church. He posts photos of himself with snakes on his Facebook page, and he aspires to pastor the first serpent-handling megachurch. His services are intense, high-energy spectacles. Dennis Covington, in his popular book, Salvation on Sand Mountain, called snake-handling services, "theater at its most intricate ... improvisational, spiritual jazz." 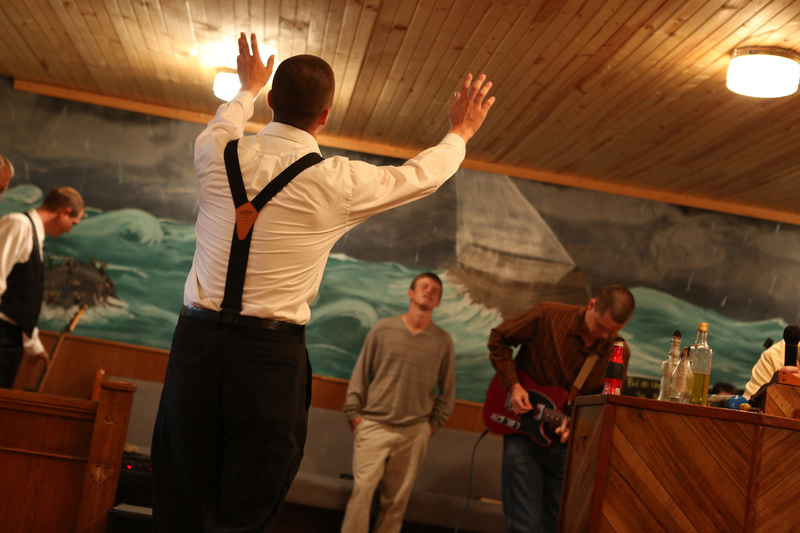 Jacob Grey raises his hands in Pastor Andrew's church. Hamblin, a talented guitarist, strums rockabilly and sings gospel for the 20 folks in his congregation. In the Holiness Church tradition, the women all wear skirts, no makeup and their hair is uncut. When Hamblin warms up, he stomps and jumps and bellows into the microphone about salvation. And at some point, he puts down his Fender guitar and picks up a pair of copperheads. The snakes are twisted around each other, and their entwined heads sway in space as he slings them carelessly back and forth. At one point, he wipes the sweat from his forehead with the coiled reptiles. The sight is terrifying; it is mesmerizing. Hamblin wears an expression of unbearable ecstasy. After the two-hour service, Hamblin explains what it feels like. "The feeling to take up serpents is unexplainable," he says. "It's better felt than told. It's a peace that surpasseth all understanding to know that you're standing there with death in your hand, and the anointment of God has protected you to let you do that." Snake handlers are notoriously private. Hamblin, like his mentor, Jamie Coots, says he opened his church to the National Geographic film crew, as he did for NPR, to educate people and dispel stereotypes. "Our message is not 'handle snakes, handle snakes, handle snakes,' " he says. "But our message is, 'Be saved by the blood of Christ.' We're not a cult. We're not freaks. We're Christians." Both pastors have a parting message: Their snake-handling churches are open for services three nights a week. Everyone is welcome.